Former 5th Ward alderman Delores Holmes speaks at City Council. Holmes and other 5th Ward residents urged aldermen to preserve a historic building in the ward. Residents urged aldermen to preserve the historic building at 2010 Dewey Ave. during a Monday Planning and Development Committee meeting. Family Focus — an organization that provides community services — currently owns the building and recently put the property up for sale. Now, residents and the Evanston Preservation Commission are recommending that aldermen designate the lot as an Evanston Landmark to be preserved as a historic part of the 5th Ward. 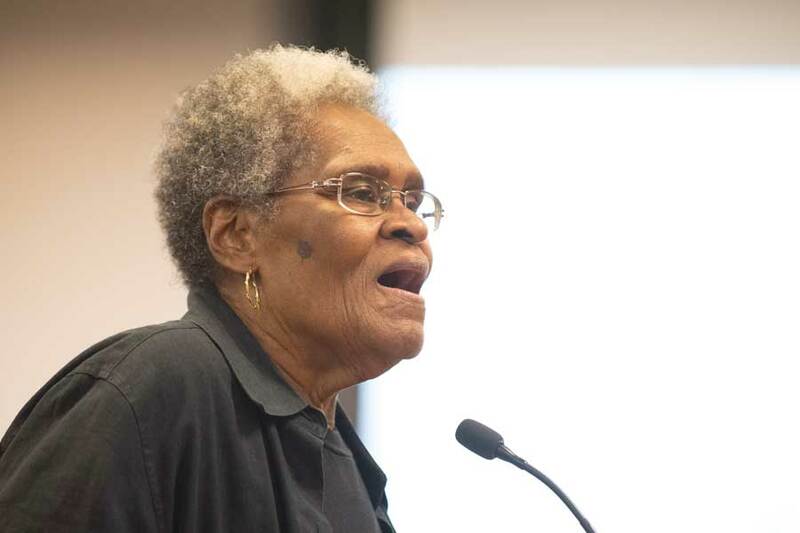 Former 5th Ward alderman Delores Holmes, who served as the director of Family Focus for 27 years, spoke in support of the building at Monday’s meeting. The building is the former home of Foster School — later renamed Dr. Martin Luther King Jr. Laboratory School — which closed in 1979. Since then, the 5th Ward has not had an elementary or middle school of its own. Decades later, children in the neighborhood are still being bused to different locations throughout the city. The building has been home to Family Focus’ Evanston location since the 1980s. The organization’s mission is to promote children’s well-being by supporting and strengthening families in the community. The building houses different neighborhood programs as well as facilities that include a gym, a theater, a computer lab and an event space. Ald. Robin Rue Simmons (5th) said she supports the preservation efforts. At 41.5 percent, the 5th Ward has the highest percentage of black residents in the city, based on the 2010 census demographic breakdown. Additionally, it is one of the only wards in which no racial group forms a majority, and the white population measures less than 60 percent. Residents have said they feel their children disproportionately bear the burden of the district’s busing method, and said the absence of a school in the ward is a missed opportunity for increased community cohesion. Stephanie Saunders, a 5th Ward resident and former Foster School student, said the building is a “lynchpin” of the community. “It’s really the last bastion that we have in the 5th Ward except for our churches,” Saunders said. “It’s a place where people continue to gather, and our children are still a part of learning about their culture in this building. Representatives of Family Focus had previously objected to the landmarking measure, saying it would hinder their ability to find a buyer for the property. After modifications of the proposal by the Preservation Commission, they agreed to allow the application to move forward. Aldermen will vote on the application at the Oct. 22 City Council meeting.